The last time I visited this town was sometimes in May 2010. It is a town in the district of Neumarkt Upper Palatinate in Bavaria, Germany. 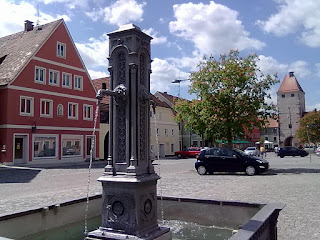 The image you see below is the fountain you can see at the Marktplatz or Market square. You can also see the one of the historical gates of this town at the background. I am just not sure if this gate is called the Upper gate or the Lower one.